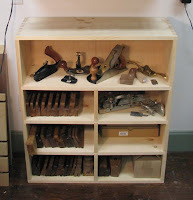 Spring fever has prompted me to try to get more organized in my shop. This means building a storage unit for the moulding planes and other tools that have been making their home in cardboard boxes. 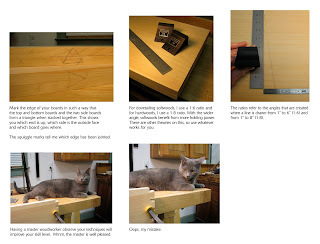 Pine is the wood of choice--it's inexpensive, smells good, and makes you feel like a champ when you handcut dovetails. 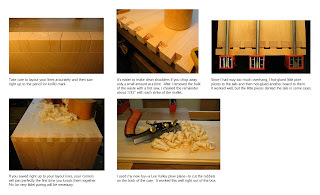 I already covered dovetails in an earlier post but here are a few additional comments. The shelves are nothing fancy, but they do provide a nicer place in which to park my planes. I decided not to add doors, even though they would help to keep dust out, because I love to visit other woodworkers' shops and see their planes in plain view.